On December 4, 2018 the Grasonville Volunteer Fire Department lost it's Fire Boat due to a fire from a malfunctioning shore power cord. The Boat serves a very large portion of the Chesapeake Bay and the tens of thousands of residents and visitors that boat, fish, and hunt within. A&M Marine Service Inc. located in Grasonville, MD reached out to donate an outboard engine to help raise funds to replace the totaled fire boat. Drawing will take place Sunday, April 14th at the Bay Bridge Powerboat show. You do not need to be present to win. 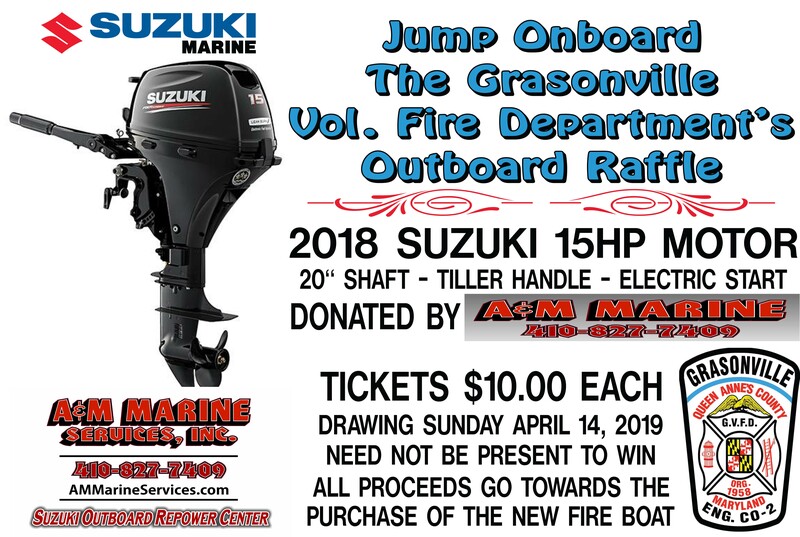 Prize is a 2018 Suzuki 15 h.p outboard engine. The 4 stroke engine is equipped with electric start, 20'' Shaft, and tiller steering. Winner is responsible for picking up or shipment of the engine.